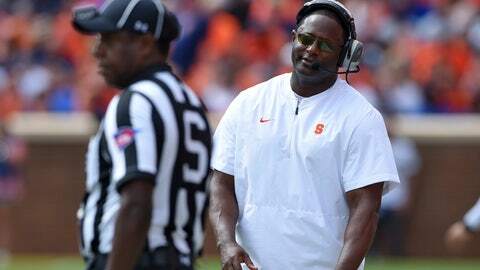 One thing is certain about Syracuse coach Dino Babers — he’s getting a kick out of watching his special teams perform. From punter Sterling Hofrichter to walk-on place-kicker Andre Szmyt to return man Sean Riley, it’s hard to find much wrong so far this season for a team that’s 4-1, the lone loss a four-point setback at unbeaten powerhouse Clemson on Saturday. Hofrichter is averaging 46 yards on 23 punts — eight of them over 50 yards — and 13 have been downed inside the 20-yard line. Szmyt, a redshirt freshman from Vernon Hills, Illinois, has missed only one field goal in 14 tries. Eleven of Hofrichter’s punts have resulted in fair catches, a testament to the hang time of his kicks. He strives for 5 seconds and has only allowed one real return so far this year — for 1 yard. No surprise the Orange are tied for third nationally with Oklahoma in punt return defense (-33) and sixth overall in net punting (43.43). Hofrichter also has notched 21 touchbacks on 44 kickoffs and opponents have been limited to an average of 15 yards among the 12 that have been returned. That ties the Orange for seventh nationally with Oklahoma. He’s booming kicks despite his 5-foot-9, 195-pound frame. Next up for Syracuse is Pitt on Saturday. Hofrichter’s prowess was on full display in the final seconds of the third quarter against Clemson when his towering, 51-yard punt was fumbled by return man Amari Rodgers and recovered by Syracuse’s Jamal Custis at the Tigers 10. Four plays later, quarterback Eric Dungey scored to give the Orange a 23-13 lead. Rodgers also fumbled another of Hofrichter’s punts but recovered it after a 2-yard loss. None of it surprises Babers, who recognizes the height in Hofrichter’s kicks. Dixon is punting for the New York Giants and Hofrichter is poised to follow in his footsteps. Szmyt’s strong right foot was on display against Clemson. He connected on three field goals in the Orange’s 27-23 loss in Death Valley and leads the Bowl Subdivision with 13 field goals. He’s also converted all 26 extra- point attempts. The 6-1, 195-pound Szmyt, who won the place-kicking job in preseason camp, was selected the Atlantic Coast Conference’s specialist of the week. His current average of 2.6 field goals per game — he’s made three in each of the last three games — leads the nation, and he’s made more than one kick in every game. He also leads the nation’s kickers with 65 points. His career-long, 51-yard field goal against Clemson is the longest in the conference this season. To put Szmyt’s performance in perspective, in the first two seasons under Babers former place-kicker Cole Murphy missed 15 field goals (he was 20 of 27 last year and 10 of 18 in 2016 with one getting blocked), while Hofrichter missed one of three attempts in 2017. As for Riley, he had 290 all-purpose yards, the fourth-highest total in school history, in a win over Connecticut two weeks ago and has returned five punts for 152 yards and one touchdown to rank in the top 10 nationally.